This year is Edge’s 10th anniversary, and few months back I was wondering to myself what we could do to celebrate that would align with our purpose and values as a company. At Edge we’re a dedicated bunch of deep-green sustainability consultants: we love getting in amongst the weeds of issues that many others treat as buzzwords for conference presentations, such as the circular economy and industrial ecology. But we’re also suckers for a cold beer on the balcony at the end of a hard day’s work saving the planet. How could we bring the two together? Back in my UK days I came across an crew called Toast Ale who make beer from waste bread. Could we mirror that initiative here? 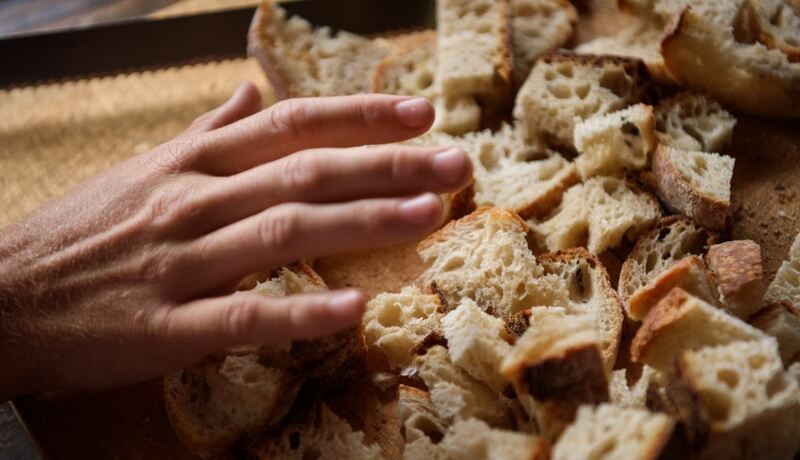 After all, here in Australia we currently send in excess of 3 million tonnes of edible food to landfill each year, with bread making a significant contribution to that total. Turning some of that in to tasty beer seemed like an appropriate nod to our mission, while also giving us something to drink at Edge’s birthday party! At first I wondered whether we might have a go at making the beer ourselves but, having had a go at that in the meantime, I realised that perhaps it’s something best left to the professionals. After all, we have a reputation for quality to think about! So I was lucky to strike up a conversation with Kiera, Sustainability Lover at our friends and neighbours 4 Pines, who immediately jumped on the idea as an opportunity for some B Corp collaboration. After a little to-ing and fro-ing, we finally hatched a plan, and a few weeks ago we spent a day together doing what must be my favourite ever activity as a paid employee of a business! Kiera did a wonderful job bringing most of the 4 Pines supply chain together. We had the barley farmer and his son, a couple of the Brasserie Bread team, John from Provenance (who supply both the Brasserie’s flour and 4 Pines’ malt), a few of the 4 Pines crew and, of course, a healthy contingent of Edge team members. We sliced and toasted bread together, shared eye-opening sustainability stories, tried a few beers and learned a lot about brewing. I can barely imagine a better reason to come to work, even if it did mean a 6 a.m. start. Tomorrow afternoon we’ll be tasting the beer, and in the meantime we’ve been running some numbers to see what difference the sustainability initiatives made to the beer’s overall impact. 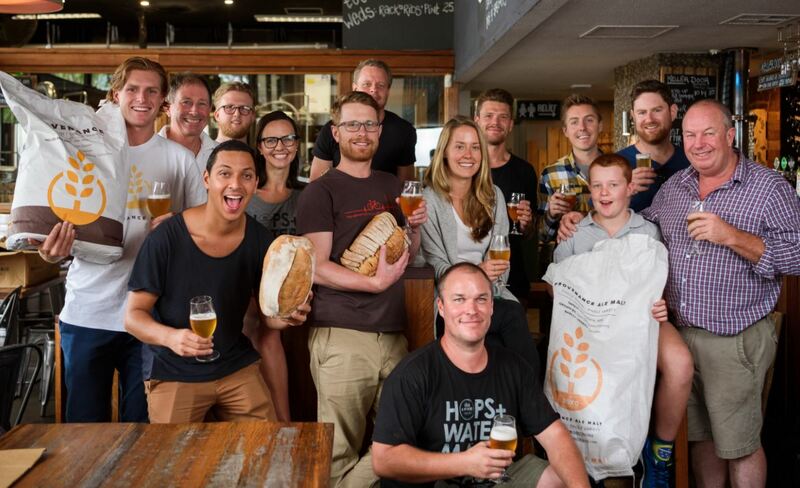 Despite some worries that the energy used to toast the bread might spoil the party, we found that our bread beer had a 24% lower carbon footprint than a comparable craft beer. The saving was a combined effect of avoiding bread going to landfill, reducing the grain used in the brew, and sending the waste material to be used as livestock feed (again, avoiding landfill). Just for fun, we also calculated that drinking the beer on site rather than bringing in a beer from another brewery in Sydney or Melbourne saved a further 1.5% or 62% respectively. Here’s to drinking local beer! On top of which, 4 Pines volunteered to buy offsets to cover the brew’s total footprint, meaning Upcycle Ale has the honour of being their first carbon neutral* beer. It is, of course, great to know that we achieved our aim of producing a more environmentally friendly beer to help us mark an important date in Edge’s life. But in many ways it was the journey that was the most interesting and important part. It was enormous fun to collaborate so closely with another BCorp to do something so innovative and that combined our missions in such a fun way. And to do that together with such a diverse group of people, and to hear their experiences and stories, was really fascinating, life-affirming stuff. And it really does prove the age-old adage that one man’s trash is another man’s treasure. There’s so much opportunity to tackle our waste crisis in ways that can create value. I’ll drink to that! *Update: 4 Pines offset 4x the amount of CO2e generated in the brewing process, so the beer is actually carbon positive and you can help save the world with every sip! A more detailed breakdown of the LCA results will follow in a separate blog. Upcycle Ale was found to have a CO2 footprint of 0.446kg per pint, against 0.519kg for a comparable beer without the substitution of bread of the landfill avoidance benefits. The calculations were based on a beer being drunk in Manly, and as such the additional impacts from drinking an alternative Sydney or Melbourne beer came from adding 25km and 1,000km of road transport respectively. No other benefits were attributed to the specific suppliers of ingredients. Impacts attributable to the cleaning of the brewing equipment, etc., and the drinking of the beer (chilling, washing glasses, etc.) were excluded as these were assumed to be the same across all scenarios. The same applies to the waste malt bags, though in 4 Pines’ case these are usually re-used for activities such a beach clean-ups, etc. (see https://www.meetup.com/GreenUps-Sydney-Green-Drinks/events/246852583/ for example).